We are a group of 5 heritage students tasked with critically reviewing our experience at a heritage attraction. Aside from our common field of study we each come from a range of backgrounds and hold our own interests that influence what we look for in a heritage site. Upon discussing this study we agreed that we should take a similar approach to that of Victoria Bell’s (2011) study of Hadrian’s Wall, in that we would each produce our own reviews of a single site (we eventually decided on Scarborough Castle) so that we might compare and contrast our individual findings, in order to understand the range of heritage experiences that can be provided by one place. In planning the trip to Scarborough Castle, I cast myself as observational researcher. My notebook contains a series of (mostly unanswered) questions about my fellow visitors and their interactions. I imagined strolling about, taking mental notes and drawing profound conclusions about participation and the social experience of heritage. Instead, I had a decidedly more sensory experience, having failed to consider the likely conditions on a coastal North Yorkshire hilltop in February. Perhaps the cultural geographer Crang had arranged a reminder from the weather gods that an “objectifying, detached gaze forms the antithetical pole to sharing, engaged qualitative work” (Crang; 2003, pg 500). Bad weather had a profound impact on the experience of visiting the castle that day (Waterson and Dittmer; 2014), emphasising its sensory or ‘haptic’ aspects, both positive and negative. We feel haptic knowledge through immediate bodily sensation — touch and the other senses, as well as movement and temperature (Paterson; 2009). At first sight, the castle induced awe at its powerful size and position, and a physical bracing against the climb to reach it through cold rain. Lingering ideas of observational research were blighted by the scarcity of visitors and the impossibility of hearing conversations over the wind. Still, the largely empty site allowed spatial clarity and a sense of place, without needing to filter out modern day visitors. Standing on the promontory, with waves rushing on either side, the towering keep behind, gulls crying overhead, salty wind tearing at me, the natural power of the place was immense. Of course settlers, kings and raiders were drawn here. Inside the keep, I clung to the rough stone walls for fear of being blown away and thought of those who had lived there. How grim in winter, how frightening under attack, and (being a practical soul) how hard to negotiate in long skirts. And so I gained a new understanding — how physical sensation can “bring distant objects and people into proximity” (Paterson, 2007: pg 1). Scarborough Castle is a place of historical wealth and importance with tremendous views over Scarborough and the North Sea. 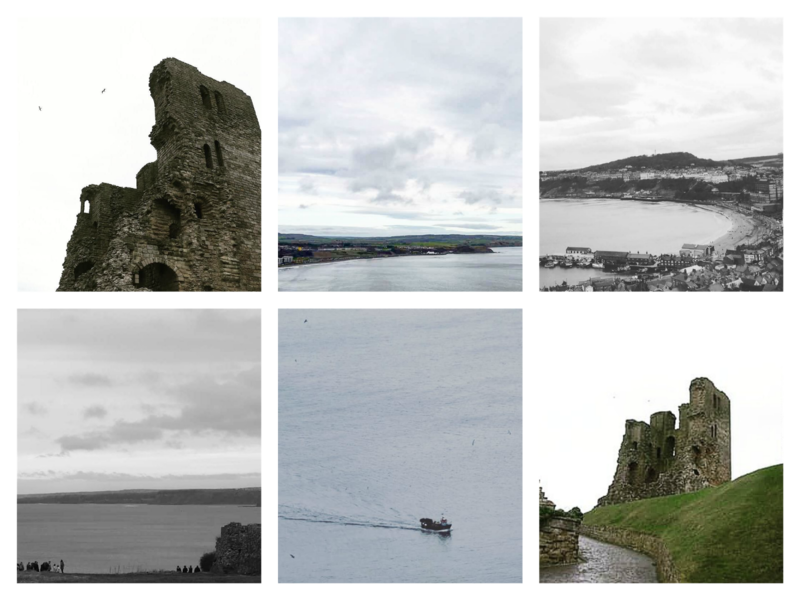 The position of the castle is superb and has stunning views over sea, town, and both north and south bays. Even on a cold and windy day it was entertaining. Moreover, even for people who show little interest in history, adults and children alike take so much from this amazing site. The most enlightening part for me is the audio tour, which contains a good mix of factual information about the site’s history and dramatized first person accounts of events like the Civil War bombardment. Visitors can use the free audio guides as a great tool to elaborate on the information boards around the massive grounds. It is a shame though, that the audio guide is only available in a handful of languages, and the written information is only in English. A particular power of this element is bring history to life by revealing it to users at every board spot where it happened, which can be a highly emotional experience. This attraction will immerse individuals of all ages into the very foundations not only of Scarborough, but of the nation. They may feel meaning when they stand on the England history, standing on the very same ground as their ancestors, such as Iron Age settlers or Roman visitors. Individuals will engage differently with particular aspects of history or culture display so emotion needs to become a central concern of exhibition and interpretive strategies in historic sites (Smith; 2015). In addition, there is a suggested guide route on this audio tour system, but visitors also can take control of their own learning and personalize the way they engage with the history on this massive historic ground (Swift; 2013). Personally, I prefer visiting without a designed route. A flexible route enables me to explore more areas and history which interest me in limited visiting time and makes me feel comfortable. As an overseas visitor, honestly, the scenery of Scarborough was more attractive than its history for me, so that I personalized the route based on the scene rather than the historic event. And I really enjoyed this with the free guide. From my experience, I wondered whether historic sites need to arrange the route for visitors? In addition, there is an exhibition upstairs from the tearoom which has lots of artifacts of 300 years of history found in and around the castle grounds. Therefore, the inside exhibition is quite helpful to better engage with the outside grounds. The design of the timeline of Scarborough castle on the panel is quite clear. I believe these information panels enable visitors to better understand historic events, even overseas visitors without lots of background knowledge of England’s history. As I gazed up at the immense, imposing castle on the cliff in Scarborough, I saw it not through the eyes of a tourist or local, but through the eyes of a heritage manager. I did see a beautiful vista, but I also saw a to-do list. I was part of a team on a field visit to Scarborough Castle, grappling with issues the Castle was having with overgrown brush around the site. The other visitors didn’t seem fazed by our haphazard group, all tottering around with clipboards and cameras, taking pictures of crumbling stone and overgrown shrubs. As a young professional, it was a bit novel to be ‘behind the curtain’ ﹘seeing the inner-workings of a site, assessing its problems, and trying to find solutions. It flavoured my experience of the site. I still paused every now and then to read interpretive panels and take in the rocky vista, running to catch up with the rest of the group. But my mind was mainly focused on how to improve the experience of everyone else, not my own. I looked at the Castle, saw what was, and imagined what could be. To paraphrase Freeman Tilden, beautiful places inspire beautiful behaviour. (Tilden; 1997, pg 110) Heritage places can inspire our imaginations; inspire us to be better people. With its rugged beauty, Scarborough Castle is that kind of place. But as it was, the surrounding environment was subtly sending the message to visitors that, ‘You don’t need to respect me, a little more won’t hurt.’ We were there that day to change that message, and in doing so, remedy the litter, the climbing, and the bonfires. I saw then how physical place can be a very powerful shaper of human behaviour, for better or worse. (Hayden; 1995) The way we take care of these special places can create positive ripples through the physical environment into the lives of other people. I have spent the past six years working within the heritage industry, the past three years of which I have worked in a role that requires me to actively promote heritage sites to potential visitors. That being the case I find almost any visit to a heritage attraction now causes me to look at it in terms of how I can ‘sell’ it to the public. Since becoming a Cultural Heritage Management student I also find I tend to look out for how heritage attractions put into practice the ideas and principles I have studied in the classroom. Whilst I do get a sense of personal enjoyment from visiting heritage attractions my professional and academic background means I struggle to fit myself into any of the categories of heritage tourist described by Poria et al (2004). Scarborough Castle is also a site I have visited previously both for leisure and in a professional capacity, and as such I set off for this visit expecting to spend my time there analysing the manner in which the site was presented to the public through the interpretive materials available on site (guide book, audio tour, information panels, etc). Having never really enjoyed the commute between my home and Scarborough, and the train journey there being quite busy and noisy, I found myself planning to approach my portion of this project by exploring how my perception of the castle was impacted by influences to my state of mind prior to arriving. However upon bumping into one of the co-authors of this essay on arriving in Scarborough, a visit that I had expected to be a solo experience became a shared one and drastically altered the way I viewed the site. Although there was still a level of analysis of the manner in which English Heritage presented its authorised heritage discourse of the site, I found there was far greater focus on architectural details as well as our previous experiences at Scarborough Castle and other heritage sites. The most interesting aspect of this however was that in experiencing a shared visit to the site we opted to ignore much of the official interpretation of the site in favour of discussing our own ideas and questions. Questions which did not need immediate answers, when asking things like ‘how old do you think this part is?’ or ‘what do you think this room was for?’ the answer was usually that we would look it up in the guidebook or online later on. For me this was a particularly valuable experience from a professional perspective as previously whenever I have promoted a site I tend to do so on the basis of its historic, architectural or aesthetic interest, but in future I will also seek to consider how a place can be experienced communally as well as the motivating factors that influence heritage tourists to visit a specific place such as those described by Biran (2015). The first time I visited Scarborough Castle was in October 2012, in the first few weeks of my undergraduate degree at the University of York — what module that trip was for, the exact points that I learned at that time or which lecturers gave us the tour, have since escaped my mind; the strongest recollections that I have of that day was the excited nervousness of a trip with my new cohorts-potential future friends, 36 photographs taken on a not-so-good smart phone, including one of myself sitting upon the St. Mary Chapel and undoubtedly having learnt something. Returning to the site over 4 years (and 4 months) later — on a trip that was meant to be solo; but instead deviated when I ran into one of the co-authors at Scarborough Railway station, turned into a completely different experience from that of my first visit. In comparison to the tour that I had received (and since forgotten), we meandered around the site discussing how it was interpreted as well as possible options for how the site developed; ‘why such a window was a different shape to the one next to it?’ and ‘were those crenellations a historical feature or added onto the walls by the Victorians?’. Where I had originally a not-so-good smartphone (even by 2012 standards), I returned to the site with a DSLR — leaving the castle with 138 photos and 1 timelapse. As I was taking the photos of the site, I noticed myself thinking about how and what I was choosing to photograph as we walked around the site. Even after returning from the site and deciding to post some of the photos I had taken onto social media, I noticed that I was drawn to particular types of photos that I had taken earlier in the day. Looking through the photos I had taken, I found that unknowingly I had been doing my best to keep a certain ratio between the ground and sky, centering the subject in the frame and emphasising the vertical lines of what I was capturing (Molyneaux; 1997, pg 76–78), and the photos that did not were positioned in such a way to emphasis the emptiness of the sea or sky ; I was trying to make the photos look as picturesque as possible, sacrificing the reality of some things; for a ‘better’ photo that would be more impactful for both myself and anyone who would see them. Instead of trying to create a documentation of the visit, I was attempting to capture the memories that I might have when I look back on the visit — I was trying to capture something that was essentially ephemeral in nature into something that I would look at and interpret in different ways as the years passed (Molyneaux; 1997, pg 88). Perhaps because we were visiting in a ‘professional’ capacity, we all arrived with preconceptions about what we would write and how the site would affect us. In fact, all five of us had entirely different experiences from our expectations, which goes to show that heritage constantly surprises. Even so, the word cloud made up of our diary entries shows we mainly used descriptive and analytical words rather than emotive ones, despite the very personal nature of our experiences at Scarborough Castle. Collier, J. & Collier, M. (1986) Visual Anthropology: Photography as a Research Method, UNM Press. Hayden, D. (1995) The Power of Place: Urban Landscapes as Public History. Cambridge: MIT Press. Hiss, T. (1990) The Experience of Place: A new way of looking at and dealing with our radically changing cities and countryside. New York: Random House. Molyneaux, B. (1997) The Cultural Life of Images: Visual Representation in Archaeology, Psychology Press. Poria, Y, Butler, R and Airey, D (2004) Links Between Tourists, Heritage, and Reasons for Visiting Heritage Sites Journal of Travel Research, 43 (1). pp. 19–28. Smith, L. (2015) Changing views? Emotional intelligence, Registers of Engagement, and the Museum. In Gosselin, V. & Livingstone, P. (eds) Museums as Sites of Historical Consciousness. Vancouver: University of British Columbia Press. Swift, F. (2013) Connecting Londoners with their city through digital technologies. Journal of Museum Education 38(1):60–68. Tilden, F. (1977) Interpreting Our Heritage, 3rd Edition. Chapel Hill: University of North Carolina Press.